Tim didn't want to be in the picture, but said he is Extremely Happy with his 8th vehicle purchase from Bruce Auto Group. Great service, friendly atmosphere. Thanks Paul, Scott and Alain. I'm very excited for my new Focus! Thank you Alain at Bruce Ford! That was the easiest purchase that I have ever made. Thanks, Alain, for my first new vehicle! This was my first Ford purchase. I'm very happy with all Bruce team. 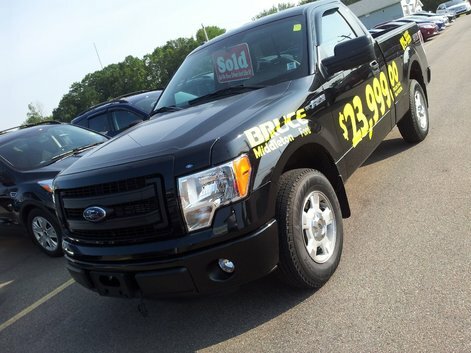 I'm so happy with my new 2013 Ford F150. I will recommend your dealership to my friends and family!